St. Charles Chrysler Dodge Jeep Ram will take the time to get to know what you want, and work with you to ensure that’s exactly what you have when you leave. That holds just as true for used-car customers as it does for new Chrysler, Dodge, Jeep or RAM customers. If you want to be pressured into a purchase, you had best go elsewhere. In addition to helping drivers find the perfect Chrysler, Dodge, Jeep or RAM match, St. Charles Chrysler Dodge Jeep Ram also boasts a state-of-the-art auto repair center where our highly skilled team of technicians perform routine maintenance as well as other services, such as auto-glass repairs, transmission repairs, and wheel repairs. And, for drivers who prefer to work on their Chrysler, Dodge, Jeep or RAM themselves, we have a variety of manufacturer-certified parts (i.e., oil filters, batteries, windshield wipers…). 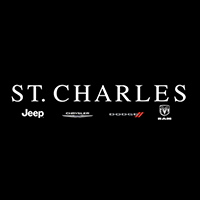 To learn more about St. Charles Chrysler Dodge Jeep Ram, our impressive lineup of new Town & Country, Grand Cherokee, Challenger, 1500, 200, and used-car models, or rave-worthy service, contact us today. Or visit us in person. We’re conveniently located at 1611 East Main St., St. Charles, IL.